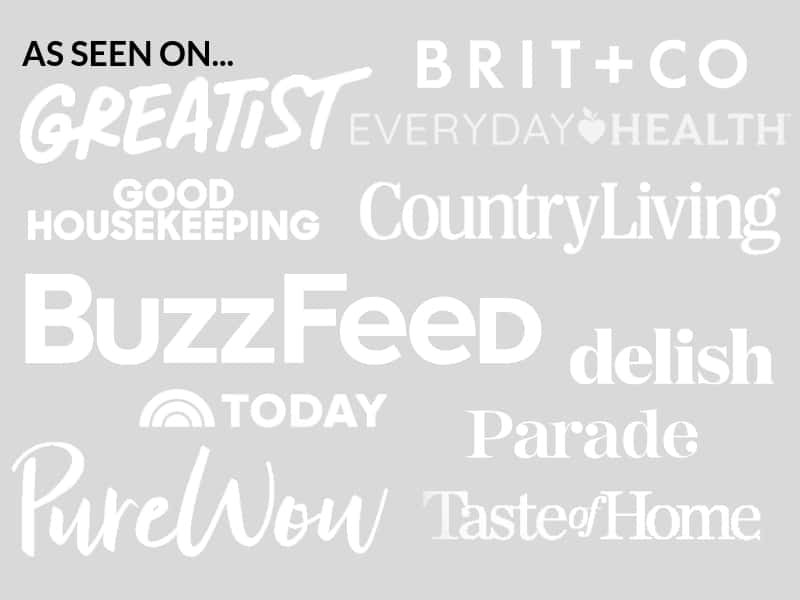 October 2, 2018 By Elizabeth Lindemann 156 Comments / This post may contain affiliate links. 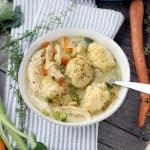 This Chicken and Dumplings recipe is SO EASY to make from scratch if you use rotisserie chicken and store-bought broth! It’s a fast, easy soul food to make on busy nights. The fresh thyme in the fluffy dumplings sets it over the edge! This, my friends, is comfort food at its finest. It has all the taste of chicken pot pie without the effort (because who has time to deal with a pie crust on a busy weeknight?). Between the fluffy dumplings with a biscuit-like texture, the juicy, tender shredded chicken, and the creamy, thick broth, this easy recipe will have you and your whole family literally RUNNING to the dinner table! 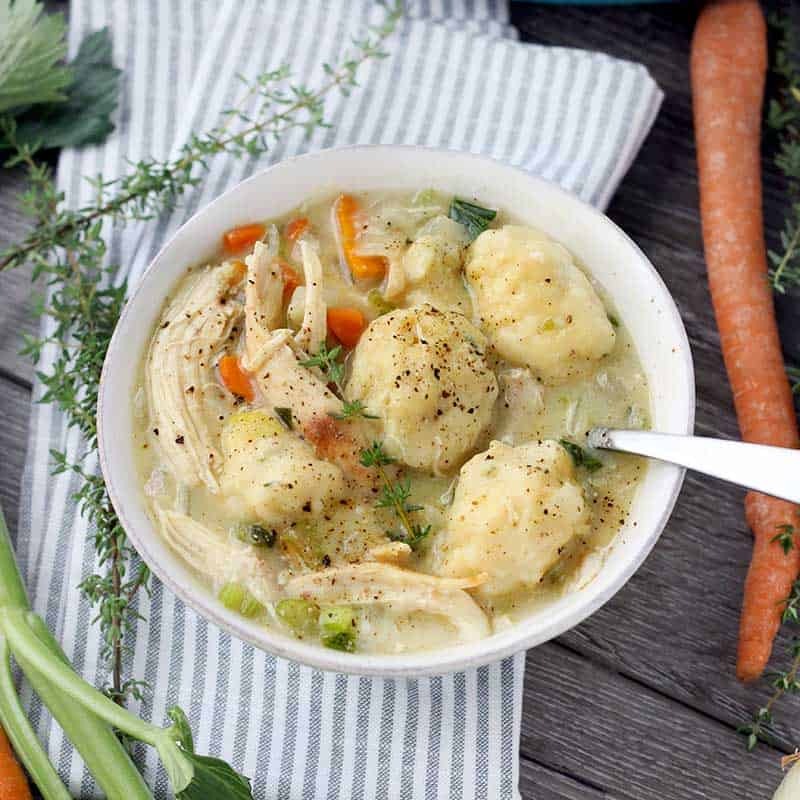 In this post I’ll explain how to make this easy chicken and dumplings from scratch in only 30 minutes with a few simple shortcuts, and give my best tips and tricks for getting the fluffiest dumplings that still hold their shape! Traditionally, chicken and dumplings is a labor-intensive process, involving boiling an entire chicken to make stock, waiting for it to cool, and de-boning it, not to mention making dumpling dough by rolling and flattening out biscuit dough. It makes a mess and takes hours. But almost every “quick and easy” recipe for chicken and dumplings I’ve come across uses processed ingredients like condensed canned creamed soup and pre-made biscuit dough. I wanted to make a version of chicken and dumplings that was fast and easy to make but used as few pre-made, processed ingredients as possible. You can make this chicken and dumplings recipe in only 30 minutes if you use shredded rotisserie chicken (or any other leftover, cooked chicken you may have) and store-bought chicken broth helps save loads of time without sacrificing any of that down-home, from scratch taste! Easy peasy. I’m telling you, this recipe for chicken and dumplings could not be easier. It cooks up super fast in only one pot! First, sauté some diced carrots, onions, and celery in some butter. Tip: use the rib AND the leaves from the celery, if you have them. The leaves are packed with flavor! Then, sprinkle some flour on the veggies and stir around to coat, and add some chicken stock and bring to a boil. The flour will help thicken the gravy-like broth to a perfect consistency. While the soup is coming to a boil, mix the dumpling dough: flour, salt, baking powder, fresh thyme, melted butter, and milk. 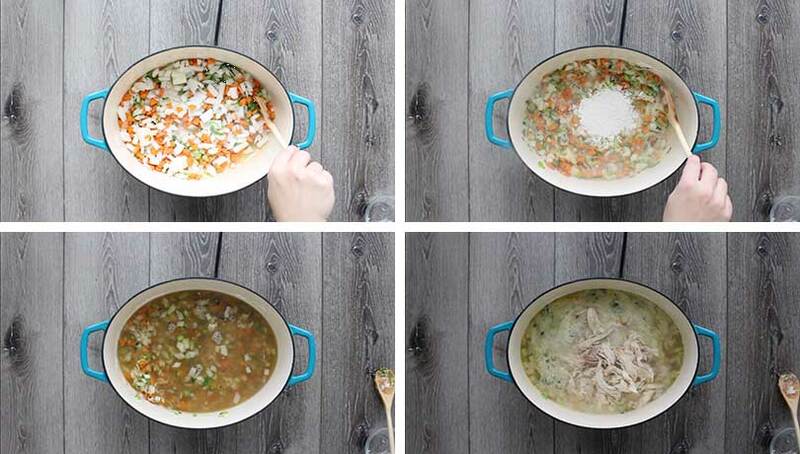 Once the soup comes to a boil, add some milk and the cooked chicken to the pot. Add scoops of the dumpling dough to the broth, cover the pot, and simmer for 15 minutes. Done! Told you that was easy. One thing to keep in mind: if the soup doesn’t seem that thick at first, don’t worry. Some of the flour from the dumpling dough will also seep into the broth, thickening it a bit more, and it will also thicken as it cools some. There are two kinds of dumplings used for chicken and dumplings. The first is a flat dumpling- the dough is rolled out and cut, then dropped in the soup. The result is a thick noodle-like consistency (like Cracker Barrel’s chicken and dumplings). The other kind of dumpling is more biscuit-like: fluffy, round balls of dough that expand and cook after being dropped in the soup. 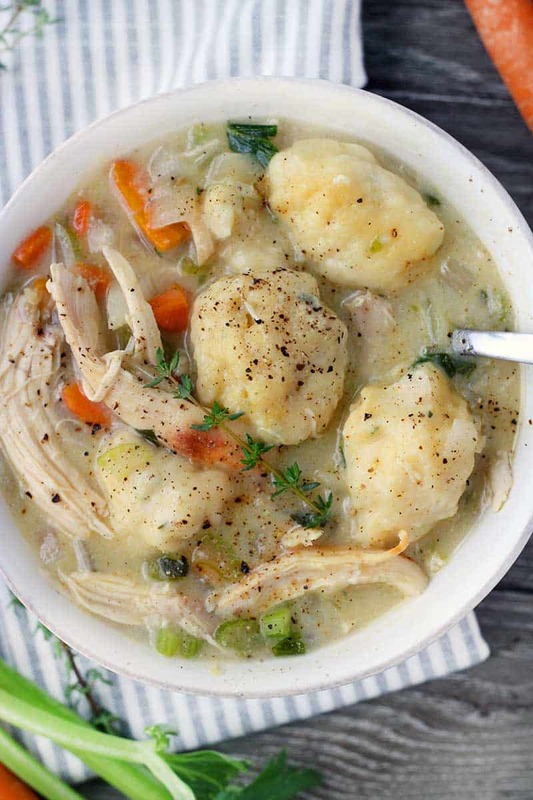 This chicken and dumplings has the fluffy kind of dumplings. Use white flour, not whole wheat. Whole wheat tends to be a bit dense and has less gluten, so the result won’t be as fluffy. If whole grains are super important to you, you can try a combination of half white and half whole wheat flour. Don’t overmix the dough. Stir it until it’s just combined and you can’t see any powdery flour anymore. Use a cookie scoop to scoop the dough into the soup. This will ensure that all the dumplings are evenly sized and fairly round. No peeking! Keep the lid on for 15 minutes while the dumplings cook. This will trap the steam and also ensure you don’t stir it, which may smush the dumplings and affect their texture. Looking for more easy comfort food recipes? Did you make this chicken and dumplings? Be sure to comment and rate it below! This Chicken and Dumplings recipe is SO EASY to make from scratch if you use rotisserie chicken and store-bought broth! It's a fast, easy comforting soul food to make on busy nights. The fresh thyme in the dumplings sets it over the edge. Saute the carrots, celery, and onions in 2 tablespoons of the butter in a large pot over medium high heat until browned and soft (about 3 minutes). Add 1/4 cup flour, stir to coat. Add chicken broth (4 cups) and bring to a boil. Turn the heat down to simmer and add 1/2 cup milk and the chicken. Season with salt and pepper. Meanwhile, to make the dumplings, mix together the remaining 1 cup of flour, 1 teaspoon salt, 1 teaspoon baking powder, and 1 teaspoon fresh thyme leaves. Stir in the remaining 2 tablespoons of butter, melted, until flour mixture is crumbly looking. Add the remaining 1/2 cup of milk and stir until just combined. Add spoonfuls of the dumpling mixture to the simmering pot- I recommend using a small cookie scoop for this (a tablespoon can also be used). Cover and simmer on low for 15 minutes, or until dumplings are fluffy, cooked, and float to the top. No peeking! Serve garnished with extra fresh thyme and fresh ground pepper, if desired. Readers have commented that this recipe doesn't make as much as they would like. Please double it if you and your family have a big appetite! You can freeze the leftovers, or double the batch and freeze one for later in an airtight container for up to 6 months. If you don't like thyme, you can use other herbs- parsley, oregano, or even dill- or leave them out entirely. Feel free to add more veggies toward the end of cooking, such as frozen peas or corn, or a few handfuls of baby spinach. This chicken and dumplings recipe first appeared on Bowl of Delicious in September, 2016. It has been edited to include a video, process shots, and more detailed instructions, tips, and tricks. Terrific, quick, and easy. This was the perfect combination of short cuts and homemade. I used the rotisserie chicken, stock I had on hand, and a bag of frozen mixed vegetables along with chopped onion. The dumplings came together very easily. And the end result tasted and looked like classic chicken and dumplings. Thanks so much for this recipe. I look forward to checking out your site a lot more often. I do not use whole milk. May I use one or two percent. Can you use buttermilk in the dumplings? You can absolutely use one or two percent milk! Keep in mind, it won’t be as creamy tasting, but it will still be delicious. And yes, buttermilk will work in the dumplings- I love that idea. Hope you like it! Thanks, making for next weekend Sunday dinner…I will let you know! Hm, are you cooking chicken before adding the onions and celery and carrots, rather than using already cooked chicken like rotisserie? If so, here’s what I’d do. A good general principle of ensuring meat doesn’t stick to the pan is to use pretty high heat, and also to allow the meat to sit undisturbed until it’s good and brown on the bottom. Once it’s browned properly, it will release more easily from the bottom of the pan. If you do have some stuck-on bits on the bottom of the pan, you can deglaze the pan by adding a little chicken broth (or white wine, if you’re feeling adventurous!) to the pan over high heat just after removing the chicken, and use a wooden spoon to scrape up any stuck-on bits. Then, proceed with the directions and add butter and the veggies. Hope that helps! Wow! I live in Canada and made this recipe tonight for my family. We all loved it!! Thank you for sharing such a hearty and nutritious recipe with those of us who love Southern food. Do you think it will be ok to make this one day ahead? i don’t have time to make it on the day I plan to serve it. Thank you! I think the leftovers reheat really well! But if you’re picky, I think the texture of the dumplings will be a bit better if you do this part the day of. In this case, I recommend making the base of the chicken and dumplings and reheating it when you are ready to serve. While it’s heating, mix up the batter for the dumplings, and proceed from there. Hope that helps, and hope you like it! I am in the middle of making this now. I used HWC instead of milk. (I don’t have milk in the house) I’m hoping it comes out good. I will let you know. It was amazing! By far the best chicken and dumplings I have ever made! My husband loved it. We ate it all! I just tried this and was so happily surprised by how it turned out! I’m from Australia, so I never had this as a kid but I think it’s going to become a staple! Thanks for sharing! I made this recipe today. It was easy and tasted incredible. Thank you! Thanks! So glad you liked it! Made this for my DIL and son last night as I am visiting to make things a bit easier after the arrival of the first baby/grandchild . WOWSA! Easy, peasy, quick and oh so delicious! Rave reviews all round. Cheddar Bay biscuits, so I snapped up a box and added the included spice packet right into the dough. It made up 20 smallish dumplings that swelled to about golf ball size or slightly larger. Amazingly tasty! The cheese and herbs were a perfect addition to an already excellent recipe. I am going to try thickening it up a bit and making a chicken pot pie with puff pastry top crust. I am obsessed with your recipes. Great site and photos, clear, easy directions and WUKCK. Have you ever made the dumpling dough ahead of time and refrigerated until ready to cook? Bringing them to room temp first before cooking. Trying to prep as much ahead as possible. The base is done and is delicious. I’ve never made the dough in advance, but I don’t think it would work very well. I think the texture may be a bit off, and they also might not puff up quite as well when you add them. To save a bit of time, I recommend mixing together the flour, salt, and baking powder. Then, when you are ready to cook, you can add the thyme, butter, and milk. Hope that helps! This was fantastic! The only thing I did differently was make more because we have a large family :). My 11 year old som made the dumplings, perfect! Definitely making again soon. Absolutely delicious! You cook like a sista from the south! You might need to do one of those tests and see if you got some black folks in your family tree! Really good, couldn’t stop eating it! Thanks! :-) So glad you liked it! Haven’t made chicken and dumplings in MANY years. I was craving it and was so glad I tried your recipe. My husband and I enjoyed it so much! Yay! So glad you both liked it! This is great! My mom made chicken and dumplings frequently, and it was, indeed, a comfort food. I’ve made it about three times in the last 45 years, and it tasted okay, but was never quite like my mom’s. I never got her recipe, so I just tried to make it up as I went along. But your recipe sounds like you hit the nail on the head, and I can’t wait to make it again! Speaking of the work involved in making chicken pot pies, I just made five 9″ ones from scratch four days ago, right down to the home made pie crust dough! LOL!!! We ate one, and I froze the other four! I made this tonight for my family and my oldest had three helpings!! It was delicious. I’m definitely saving this recipe for the future. Thank you for sharing your recipe. This was the first time that I ever tried making Chicken and Dumplings, and I’m thrilled to report that it turned out delicious! So glad I found your recipe! Yay! So happy you liked it! I made this last night, and I absolutely loved it! What’s even better is that my 2-year old never even picked his head up from his bowl because he was so focused on eating! I just had to leave a comment because that’s what got me to try it in the first place. When I see a recipe get such high praise, it makes me even more interested especially since reading the recipe makes it seem so easy. I couldn’t even imagine it would have so much flavor! The thyme really makes it special. As for adjustments (because I read comments for this too), I only had 3 cups of broth so I used one cup of broth using the Better Than Bouillon we had from Costco. I also used heavy cream instead of milk in the broth because I have some leftover from another recipe and figured if it made things thicker, it would be fine by me! Lastly, my dough was more watery than yours was (thanks for having the video so I could actually see that! ), so I added a little more flour at a time until it looked more like the consistency you showed. I’m so excited for lunch because my son and I are having the leftovers! This made my “Recipes Worth Repeating” Pinterest board! Oh wow- thanks so much for leaving such a wonderful comment! I’m happy you and your two-year-old liked it (I have one too- sometimes she’s hard to feed for sure!). My FAVORITE chicken and dumpling recipe. And super easy to make dumplings! So much easier and tastier than using the Pillsbury dough, and your dumplings stay together. Made it 5 times now and get rave reviews every time! I make it in the instant pot on the medium sauté setting. Cook the chicken in first, then remove it and follow the recipe. I substitute organic chicken stock instead of the broth because it’s what I have in the house and wouldn’t go back! Also add some drained canned corn right before I put in the dumplings. Can’t go wrong! Must cook recipe!! Saved as one of my go-tos! Thanks so much! I’m so happy you liked it! I love the idea of adding some corn at the end. Yum. I never leave comments but I’ve made this 3 times. It’s so good! Thanks! I’m so happy you liked it! This is the best I’ve ever tasted! Perfect favors. I will be making this again soon. I won’t change a thing. Thank you so much. Very good and easy! My hubby doesn’t care for thyme, so we left that out of the dumplings, but we loved it! Thanks! 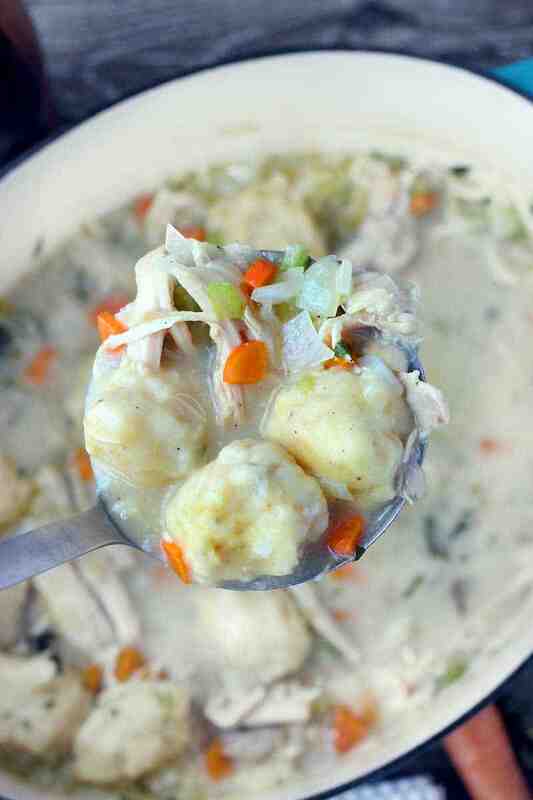 I’ve been making Chicken and Dumplings for years and this is without a doubt the best recipe I’ve found!! The only tweak we made is we omitted the celery and carrots since I’m not a fan of celery and my husband hates carrots. ? We both agreed that it was the best either of us have ever had. Thank you for this great and wholly satisfying recipe!